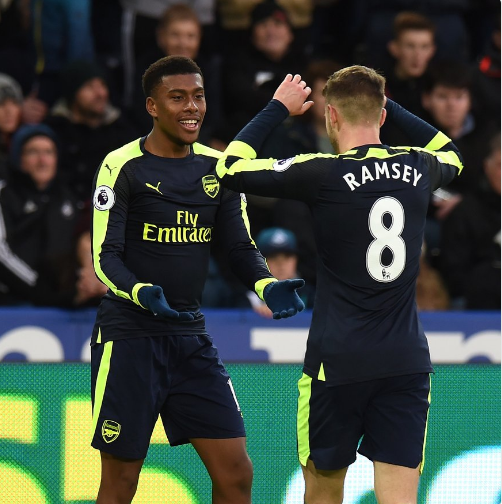 Super Eagles forward Alex Iwobi put up a superlative form as Arsenal thrashed Swansea City 4-0 in their week 21 Premier League fixture at the Liberty Stadium on Saturday. Much-maligned Arsenal striker Oliver Giroud gave his North London side the lead eight minutes before halftime. Iwobi’s deflected shot gave Arsene Wenger’s side 2-0 lead just after the interval and his cross soon deflected off Kyle Naughton to give Arsenal a third goal before Chilean forward Alexis Sanchez rounded off the scoring for the Gunners. Elsewhere at the Vicarage Road, Super Eagles striker, Odion Jude Ighalo sat on the bench for the entire duration as Watford played scoreless draw with Middlesbrough in the home Premier League tie. The win over Swansea City takes Arsenal two places from 5th to 3rd spot above Manchester City and Liverpool with 44‎ points while Swansea City still stay in the relegation zone with 15 points.